For educators who want to develop VC technology in their classrooms. To communicate, collaborate, educate and innovate. 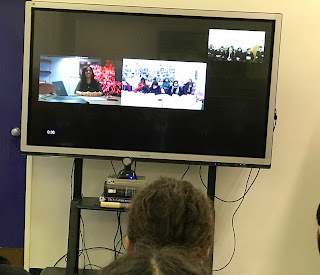 Last term, over 450 primary and secondary school students connected over video conference to representatives from Midwich, Vodafone and Nomura International PLC. The aim of the career talks were to give guidance and inspiration to young people who may not have an understanding of the exciting opportunities that can arise from working with technology and the audio visual (AV) industry. The organisations supporting this outreach all have members belonging to the AV user group and had stepped forward to promote their sector to young people through using video conference ( an AV technology). A Year 9 pupil quoted after hearing the presentation from Midwich," Naina had taught me how to succeed in a career and it was great to hear about the industry from a personal insight". Another year 9 pupil quotes: I learnt that going outside of your comfort zone is worth it. From the survey carried out with some of the schools, the pupils who participated in the talks had not heard of the companies before ( except Vodafone) and none of the pupils had thought of doing careers similar to those of the speakers. However, after the presentations 39% of the pupils aspired to careers in STEM, IT/AV. 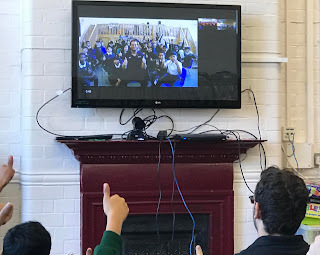 95% of the students thought it was a great idea to connect over video conference to meet people who want to talk about their jobs and organisations. There is the fact, that a face to face meeting would be much better, however to connect one individual to so many students from different schools, in one afternoon, would take a lot more time and resource and be nearly impossible to achieve without the technology. 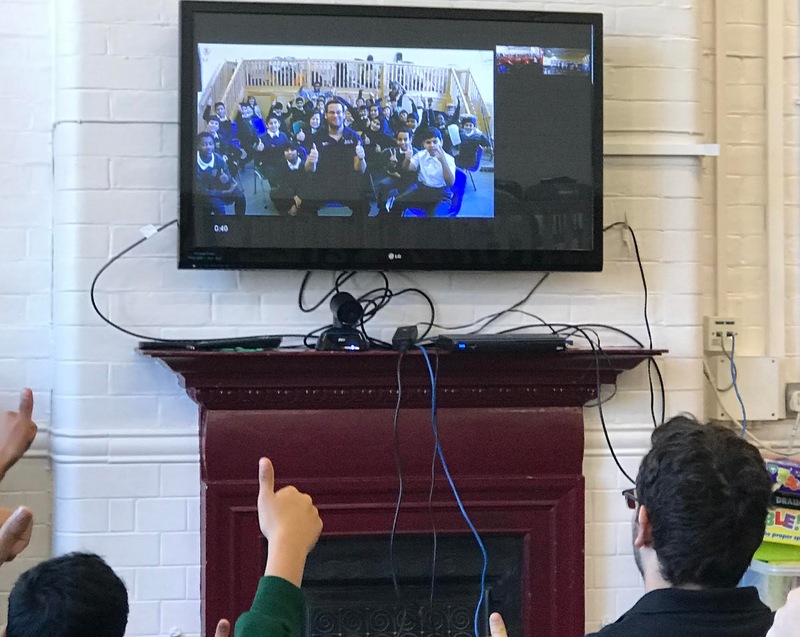 A year 12 pupil stated after connecting to Tim : Video conferencing is an easier way to connect, so we are aware of the opportunities computer science brings. We learnt about the types of coding, what coding can do eg. programming equipment. The difference the internet has made to our lives. A year 11 pupil quoted: I learnt about Vodafone, coding and wifi frequency and that it is possible to have a mobile network on the moon! Connecting over video conference meant multiple schools from Redbridge, in NE London were able to link directly to banks and businesses, by dialing an IP number through a secure connection. This saved travel money and time for the speakers who sat in the comfort of their offices and spoke directly with the students sharing videos and images to answer questions. 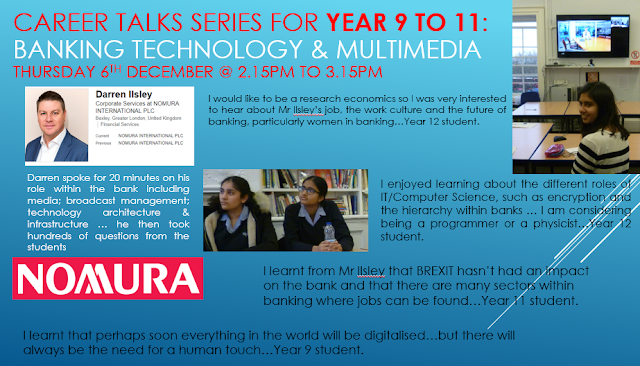 Please read the feedback below given by the girls in Year 11 and 12 at Woodford County High School after speaking to Darren Ilsley at Nomura International PLC. Many thanks to the schools for sharing their feedback and to WCHS for sharing their presentation below. The schools in the LB of Redbridge wish to thank Darren, Naina and Tim for their presentations and we look forward to connecting to you again. 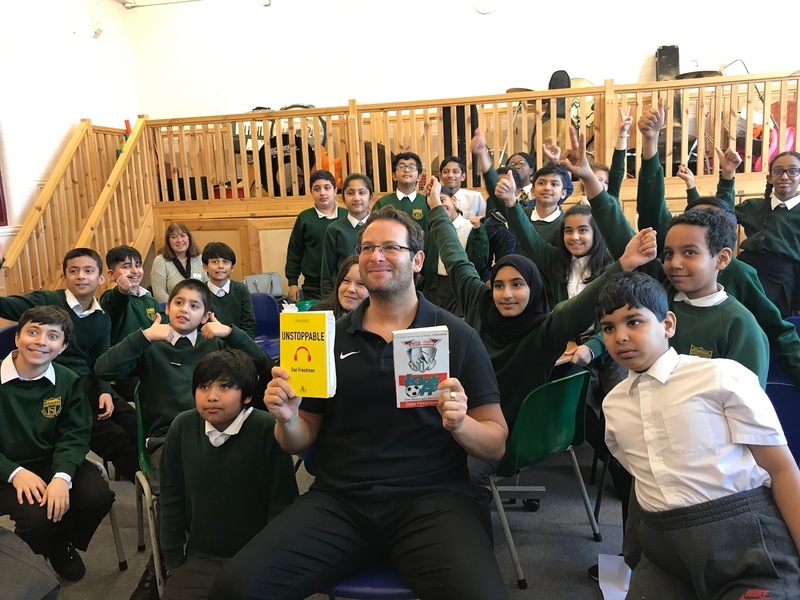 Dan Freedman, children's book author and former football journalist took part over video conference, live from Highlands Primary School, to connect to schools across Redbridge to hear the children's football chants and speak to them about his series of Jamie Johnson's books, which are now broadcast on TV with the BBC. Dan shared quotes from his yet to be published book "Unstoppable" (he told the children he had been working on writing it for five years!). He answered questions from the children about his career, what inspires him, his childhood, and gave advice to the children for writing their own stories. Dan also judged a competition held to find the best football chant. 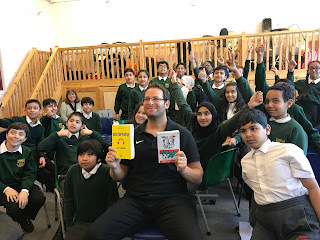 Well done, to the three winners, who each received a signed book from Dan: Fairlop Primary, Gearies Primary and Avanti Court Primary. Dan quotes: The technology worked really well and I could clearly hear and see all the children from the schools. The ability for me to reach out to them all at once in such a short period of time was just fantastic. The chants were all, incredible, well written, sang and choreographed. I felt very emotional when i heard the Jamie Johnson chant. Matthew Patterson, Class teacher at Highlands said, " for the children to meet an author and speak to him, while connected to other local schools, over video conference makes them all feel part of the same "fan club", because they have all read the same book and now they get to ask questions to the author, about the characters and this is what makes learning real for them". 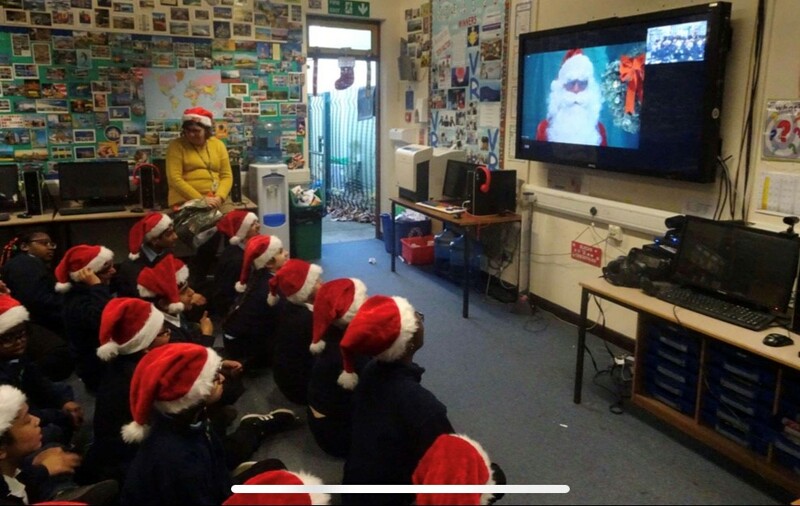 Year 6 pupil at Highlands quotes: It is not usual for us to have the opportunity to meet an author and with the video conference we do not need to travel to see him or other children from other schools. I can`t wait to go home, and read my new book, Skills from Brazil. On Dec 12th, Santa sat in front of his HD video conference camera and microphone in New York State at 8am in the morning. He dialed over 12 schools across Redbridge speaking to over 400, Reception and Year 1 children during their afternoon class time. Santa quotes "It was a joy doing those sessions. Seeing the excitement on the children's faces, finding creative answers to their wondering questions, hearing their sweet voices sing Jingle Bells - all makes for a joyous soul enriching experience for dear ole Santa Claus". The schools in Redbridge would like to thank Rene Caver (AKA, Santa Claus) from the NYDL. Copyright © 2019 - Video Conferencing for Learning Ltd. Picture Window theme. Powered by Blogger.